Summary: Rose Weasley is bored and looking for excitement. The corridor was dark, leading to an archway, shadowed with deep mysteries…. The corridor was dark, it was true, but there were no deep mysteries at Hogwarts any more. Not unless you counted the issue of how her brother had managed to score himself a girlfriend who was neither short-sighted nor stupid. Rose glared at the inoffensive corridor. It was hard being the daughter of two war heroes. People were always expecting her to be interesting or brave, and not plump and redheaded. She was supposed to be bright, like her mother, but had never managed to rise above third in any class. She was supposed to be athletic, like her father, but she was only good enough to be first reserve for the Gryffindor team. But more than that, she was supposed to be happy with her gilded life. Rose heaved a sigh and scuffed her shoe along the floor. Nothing ever happened to her. Nothing interesting. Even her parents' divorce had been polite and had barely made a ripple in the Daily Prophet. Rose propped a shoulder against the wall, and wished that something interesting, something dangerous even, could happen to her. She really shouldn't have been surprised when the wall behind her disappeared. Nor when the portrait spoke to her. It was entirely reasonable to be surprised that it was Professor Snape that was speaking. "Who are you?" he snapped. "Erm, Rose, Rose Weasley," she replied. "Erm, Rose, Rose, is an odd name," Snape said, his lips twisted into a sneer. "But what can we expect from a Weasley?" "It's just Rose," she said firmly. "And to be clear, that's not Justrose, it's just… Rose." "Miss Weasley," Snape said, then closed his eyes. "Is that it? Is that all you've got to say?" Snape rested in his painted chair, with his painted eyes firmly closed, and his painted hands folded before him, looking like a medieval saint. "Well?" said Rose. "My mum says I'm very persistent, and I've got all day to keep asking you questions." Snape didn't open his eyes, but did make a reply. "And your mother is?" "Hermione Granger. I thought everyone knew that." Snape's eyes opened, glittering at her wildly. "I've been trapped in a room on my own for the last ten years, with only house elves and ghosts for conversation. Oddly enough, you didn't come up. Nor did your mother." "I'm surprised." Rose scowled. "Everyone else likes talking about her. Especially the Daily Prophet. She's always in the paper." "I haven't kept up my subscription," Snape said, dry as a desert. "Oh," said Rose. There was an awkward pause, then she added, "Well, the short story is Mum and Dad got married shortly after … you know… and then they had me and Hugo, and then Dad decided he liked someone else. Lots of someone else's, to be fair, and Mum decided that she liked her self-respect more than she liked my Dad, and they got divorced." Rose paused, and looked away from Snape's too-knowing eyes. "It was a difficult time," she said eventually. "But we're much happier now." "And which of your parents told you that?" Snape said softly. "Both of them," Rose said brightly. "And they still love us, and it's not our fault they split up. They're very clear about that." "Ah," said Snape, and leaned back in his chair again. "I don't suppose I could ask you something?" Rose said. "I'm not going to talk about being a Death eater," Snape said flatly. "Oh no, I don't want to know about that. I was just wondering whether you could help me with my homework. Old Sluggy doesn't explain things very well, and I could do with some extra tuition." "You want to use me to cheat in Potions?" Snape asked. "No, that would be wrong. I just want you to let me practise with you, so I can get better marks. Mum always looked so disappointed with me when she gets my school reports, so it would be nice if I could do as well as Hugo." Rose nodded. "He's a bit gifted, really. He's cleverer than me, I know that, and Mum likes that. She knows what to talk to him about, and she tries, she does try talking about Quidditch with me, but I know that she thinks it's a bit silly and boring. I thought it would be nice if, next time I'm home, I could show her that I was working hard." "Erm, I dunno. What would you like?" Snape's eyes glittered in the dim light, and his lips curved in a peculiar smile. "Oh, I'll think of something. Come back tomorrow with your latest essay and we'll talk it through." Rose had worried that she'd not be able to find the little room with Snape's portrait again, but the castle had clearly decided that she should be allowed to see him again, and the room was just where she'd left it the day before. "I've brought my essay," she said. "It's about the sleeping draughts. There's this bit about lavender, which I don't understand." Snape raised an eyebrow. "Haven't you read the set text? I'm not going to help you if you're not prepared to help yourself." "I want to know what you want in return," she said. "I know better than to make open ended deals with anyone, let alone someone as clever as you." Snape smirked. "Who says I want anything?" Rose narrowed her eyes. "Because you're evading the question. That means you're up to something." "Perhaps I want to repay your mother for all the help she gave me?" 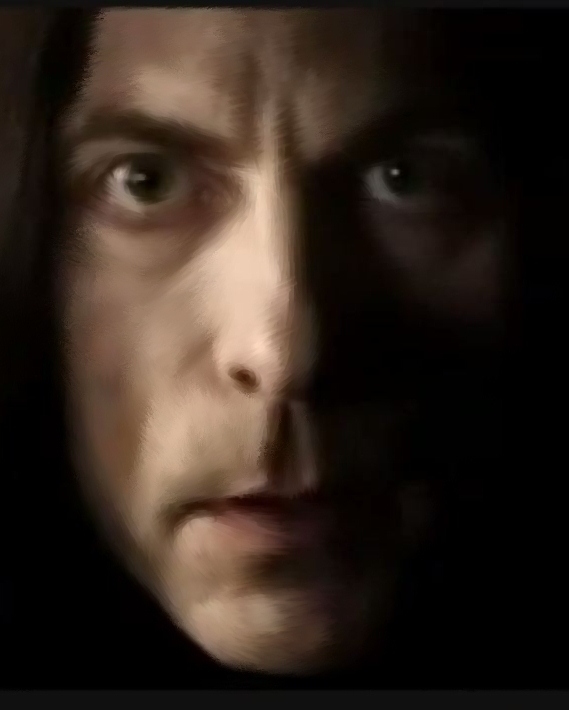 Severus's smirk broadened. "And I'm bored. Even teaching a little Gryffindor how to brew basic potions is better than spending time talking to Winky about the best way to peel potatoes or clean in all the corners." "Now that makes sense." Rose nodded her head, and fumbled in her satchel for her essay. "Now, it's this bit here…"
Rose enjoyed seeing her marks improve. She got her first Exceeds Expectations, and wrote to her mother, getting a proud note in return. "I could get used to this," Rose said. "Being teacher's pet. It's fun. I never realised." Snape scowled. "It's not hard to impress Slughorn. Being the child of famous parents should do it." "Well, it didn't." Rose's scowl was a mirror of Snape's. "Your potions work must have been really dire, then." "Get knotted," Rose said sourly. "We can't all be potions geniuses. Not like Mum." "Your mother is not a potions genius. She was barely competent at school and that by parroting the works of others. She had no feel or flair for the subject." "She does all right now." Rose looked puzzled. "She does a lot of potions research for St Mungo's." Snape drew back his lips in a snarl, but whatever he was burning to say, he thought better of it, and pulled his thin lips into a semblance of a smile. "Indeed. So, with hard work and commitment, even the least promising student can go on to excel." Rose fixed him with a hard stare. "Right," she said. "So let's get on with the hard work." The work was hard indeed, and Rose found herself getting up early to see Snapey before breakfast, and pretending to work in the library in the evenings. She grew thin and pale, and wore dark shadows under her eyes like bruises. She looked a little like Snape herself, these days, she thought. Her annoying little brother had other thoughts. "I know what you're up to," he said to her, cornering her after potions one day. "All this sucking up to Slughorn to get better grades. It's disgusting." "You wish. I earned my marks through hard work." "You expect me to believe that you're spending all your time in the library working on your homework? Funny how I've never seen you in there." Rose sighed. "Sometimes I'm in the library, and sometimes I work in a quiet classroom because I can't get any peace and quiet in the library, what with annoying little brothers hanging round the place." Hugo glared at her. "You've got a boyfriend. I bet you're getting him to do your homework for you, you little cheat." Rose snorted at the thought of Snape being called her boyfriend. "Yeah, that's it. Your sister couldn't be bright enough to do it herself. She has to be copying from a boy. You tell Mum that and see how well she takes that." "I didn't mean it like that," he said crossly. "You know I didn't." Rose arched an eyebrow at her brother, a trick she'd acquired from Severus now she thought about it. "All right," Hugo said, sighing. "I won't say anything to Mum. It's just, why couldn't you leave it alone? Isn't it enough that Dad liked you best, what with the Quidditch and everything? Why did you have to compete with me about potions?" Hugo ran off down the corridor, making sniffing sounds that made it sound horribly like he'd been crying. "I don't know that I want to continue with this," Rose said. Snape cocked an eyebrow at her. "It's not that I don't appreciate all your help, but… Well, it's upsetting Hugo." Snape steepled his hands in front of him, fingers touching his lips. "So you will allow a member of your family to make you be lesser than you could be, simply to keep him happy?" "Isn't it? Is that not what it was like for your mother?" "I thought you said you'd been isolated in this room? That you'd not heard any news? Has someone brought you some old Daily Prophets or something?" Rose took a deep breath, and forced the familiar anger down. Everyone had an opinion about her parents, and they were mostly wrong, and the more she defended them, the more people took that to mean that they'd hit on the truth of the matter. People were stupid, she thought. "I extrapolated," Snape said, leaning back in his chair with a faint smile on his lips. "Based on what I know about your parents, and how they behaved at school. And then you confirmed it." "All right, Dad was a bit difficult when Mum was doing well at the Ministry, but this is different!" "Is it now?" Snape leaned forward again and fixed her with his dark, piercing eyes. "Your brother is using your guilt and your love to control you. How is that different?" "I… dunno." Rose stared at her feet, turning it over in her mind. How was it different? "I just don't want him to hate me." Snape sighed. "His nose is out of joint, but he'll come round. I assume he sorted into Gryffindor – they're not the sort to hold grudges. Not over things like this." "I suppose." Rose shrugged, letting the strain of her decision free. "I suppose we should get on then." "Indeed – now tell me, what are you to try next in Potions?" "Sluggy said something about the Draught of Living Death. But I thought that was prohibited as being too dangerous for students to brew." Rose rummaged in her school bag to find her potions text book, a pen and paper. "Oh tosh! I had my students brew it for years without mishap. You'll just have to be careful. And I have one or two suggestions as to how the brew might be improved." Rose took her pen in her hand and prepared to take notes. Already, in her mind's eye she could see her brother's envious glances when she took the highest marks in the class. That'd show him! Rose could feel a drop of sweat making its way down her spine, and several more forming up on her forehead. She couldn't spare a hand to wipe them away, and had to shake herself like a dog to make sure they didn't end up in her potion. She kept a careful eye on the height of the flame under her cauldron, deftly stirring the potion with one hand whilst the other tracked down the expanded notes she had worked up with Snape on how to brew the Draught of Living Death. She counted to herself under her breath, one hundred, two hundred, three hundred, the seconds ticking down until she had to add the three drops of lavender oil that Snape had suggested would make the potion bind more easily. She held the vial over the cauldron, counted off another four beats, and then turned it over. Time slowed to a crawl, so that she was aware of Slughorn's concerned face at the other side of the room, the drip-drop of the oil, his shout calling on her to stop, and the way the drops hesitated before plunging into the depths of the potion, tunnelling their way through to the bottom of the cauldron. Time snapped back into place with the force of a blow. Slughorn said, "What did you add? What was it?" The potion bubbled up over the side of the cauldron, emitting purple smoke, and Rose fell slowly, inexorably into the purple billows. There were words spoken after that, but the speaker sounded as if they were underwater, or speaking Mermish, for all the sense they made. The bubbles of the potion were swirling through her mind, and everything seemed cloudy and grey. "… need to get her to the infirmary….."
"… don't know what she did…." The floor rose and fell beneath her like billowing waves, and she felt a wave of nausea. The world wasn't built to do that, and neither was her stomach. Something had gone wrong, she thought, something she'd mistaken in the instructions, and wouldn't Professor Snape be cross with her. "… what was that she said?" The voices in her head kept talking insistently about her staying awake, and what had she done. "Something about Professor Snape, I think." "Well, he would be the natural choice to deal with something like this, if he can be persuaded to help." And then Rose heard her mother's firm voice saying, "He can be persuaded all right." And Rose knew everything was going to be all right. The next time Rose opened her eyes, the infirmary was dimly lit. Her mother sat by a guttering candle, pretending to read, and to her side was a dark shape that was all together larger than her brother. Her mum leaned forward and patter her hand. "He'll be here tomorrow. He wanted to come, I promise, but he needs to sort out someone to cover for him and there wasn't much point him being here if you were asleep." Her mum smiled. "He's got a week off work, you know, so you'll be sick and tired of him fussing round you by then." "Ah." Her mum leaned back in her chair. "Can you keep a secret?" Rose nodded, then wished she hadn't, as the movement of her head set off stars behind her eyes. "You remember that I told you I was working on something really secret for the Ministry?" "Well, this person was helping me on that project but he's not supposed to be in the country, so…." "I won't tell," Rose said. There was nothing to tell, because she still couldn't see the face of the man sat next to her mum. "Good." Her mum looked at her companion, a question in her eyes. "Rose, I'd like you to meet Professor Snape," her mum said. Rose shot upright on her bed, provoking more stars and some new, red blotches floating across her vision. "That can't be," she said. "He's dead." "I can assure you that the rumours of my death have been greatly exaggerated," the man said. He sounded like her Snape. A dark, deep voice, that curled round your spine and demanded obedience, and wormed its way into your heart and soul. "Someone needs to tell your portrait then," Rose said flatly. "Because I think he just tried to kill me." She supposed that a mother who'd spent her seventh year chasing down Dark Lords was a woman who was beyond being shocked, and one who tended to believe the impossible without demur. But it was Snape who fixed her with familiar eyes, and said, "Tell me." The story took some time, though no one interrupted her or asked her any questions, letting her tale run its winding course to the final conclusion. "And he told me to add the Lavender oil just at the end, and I didn't think it was right at the time, but … well, it was Snape, the greatest potion brewer ever. That's what you called him, Mum, and I thought he knew better." "Greatest potion brewer ever, eh?" Snape said drily, and her mother blushed. "That's not what you said last week. Last week, I was an imbecile who would keep arguing about the obvious." "Shush." Her mum nudged Snape with her shoulder. "Tell me again, what the portrait said when you asked him what he wanted." Rose thought back to that first meeting, tried to filter out the assumptions she'd made, and what she thought Snape had said, to what he'd actually said. "He said that he wanted to repay Mum for all her help," she said. "Ah," Snape said softly. "That is not …." "He said that he hadn't been keeping up with the news," Hermione said. "So that last thing he knew, he'd been left to die in a shack in a pool of his own blood. That's the help he was looking to repay. Oh darling, you could have been killed." Her mum reached across the bed to pull Rose into a tight hug. "Can't breathe, Mum," she said. Professor Snape was watching them both carefully, his face so carefully arranged in a neutral expression that it could only be a mask hiding something deeper. "I am sorry," he said eventually, his words aimed at the space between Rose and Hermione. "It's not your fault," Hermione said firmly. "It's not you in that portrait, just a shadow of you." Rose took a deep, shuddering breath. "It isn't you, is it?" Snape stood up, his face moving from shadow into light, with the faintest crack in his mask allowing some of his unease to show. "I suppose not." "Your heart must have stopped long enough for your portrait to be created," Hermione said. "It's a fleeting impression of who you were at that point, but that point was one filled with bitterness and rage. That's not who you are now." "That's very forgiving of you, where your child is concerned," Snape said after a long pause. "Something will have to be done about the portrait, of course. A permanent sticking charm and a Silencio that will last a hundred years or more should do the trick." Hermione smiled, but there was no warmth to it. Rose looked at Snape and then her Mum, and wondered. "I don't think we should do that. We should talk to him first, see what he has to say when he realises he's alive." Hermione smiled again, but with some real warmth this time. "I don't think the English language has the pronouns to deal with a talking portrait and a man, all in the same sentence." "Maybe not. Rose giggled. "I'm not sure the world is big enough for the two of them anyway." "You try and get some sleep and we'll talk about it in the morning," Hermione said, and kissed her daughter's forehead. "Don't worry about a thing." The next time she woke, sunlight was breaking through the windows and making its presence known by tapping on her eyelids. She stretched and considered whether she could roll over and go back to sleep or whether she needed a wee first. "Wake up, sleepy head. You're missing all the fun." She opened her eyes and glared at her brother. "What are you doing here?" "Offering help and support to me dearest sister," he replied. "What else?" "Yeah, thanks," she said, and slumped further down in the bed. "Aren't you going to ask me what's happening?" "I already know," Rose said, through gritted teeth. "I was nearly killed by a portrait. End of discussion." "Oh that," Hugo said, and waved his hand dismissively. "That's old news. No, I meant what's happening now." "Well, what is happening now? Tell me, or I'll hex your hair green for a year." "Well Dad turned up when Mum and Mr Snape were sorting out his portrait, and there was a huge row." Hugo helped himself to a chocolate frog from the stash on her bedside cabinet. "Oi, those are mine," she said. "Who brought them, anyway?" "Dad," Hugo said. "And he said we should share." "He's still arguing with Mum. He wants the portrait burned, but Mum isn't sure what effect that would have on Mr Snape so she doesn't want to do that, and Dad's all, so you think more of Snape than you do of your own child. You can hear them all round the castle. It's amazing." "I'm glad I missed that," Rose said. "I remember what the old arguments were like." Brother and sister exchanged a look of perfect understanding. "So, has Dad given in yet?" Rose asked, filching her own chocolate frog. Hugo shrugged. "It's gone quiet. Which means one of them has remembered the silencing charms at last." Rose sighed. "I hope Dad doesn't storm off in a huff. I'd like to see him." A dark shadow appeared in the doorway, slanting across the floor to merge with the tall shape standing there. "Mr Snape," Hugo said, and slipped from his perch on the bed. "Mr Weasley. Miss Weasley." Snape crossed the infirmary floor, his robes fluttering in his wake. "And how is the patient feeling this morning?" "Better," she said. "Do you know what's going on?" "I do not," Snape said. "Don't worry," Hugo said. "Mum will win. Mum always does." "I see," Snape said, raising an eyebrow at Hugo. "Don't let him put you off," Rose put in. "Mum doesn't always win arguments." A faint smile tugged at the corners of Snape's mouth. "I know." "You mean you win arguments with Mum," Hugo said, with respect in his voice. "Wow." "Well I am the greatest potionsmaster in the world," Snape said, his smile widening. "Your mother said so, and she's never wrong according to her." Rose giggled. "Are you going to be our new dad?" "No," Snape said, his face wearing that careful mask again. "Good," said Rose. "I don't need another Dad. But if you want me to put a good word in for you with Mum, I will need help with my potions' homework. Because then she'll be pleased with me, and with you, and she'll be happy." "Are you attempting to blackmail me?" Snape asked. "I just … I'm just making you an offer," she said. "I quite liked you when you weren't trying to kill me." Hugo snorted. "She just wants to get good marks at Potions." "That seems to me to be an eminently sensible thing to want," Snape replied. "And something that ought to be encouraged." "We have a deal then?" Rose asked. "You don't try and poison me, get me the top scores in my year for my Potions Newts, and I don't kick up a fuss about you dating Mum." "Very well. It's a deal. And it will be the top scores in your Newts for decades. I'm not risking my reputation for the highest standards for anything less than that, not even for a stepdaughter." Rose nodded. She could live with that.